27-Jan-2002 -- A beautiful winter morning, -20C on the thermometer. Started at 9:15 a.m. from Boliden and drove to Norsjö and Gransjö, 65 km from home as the crow flies. Stopped at a farm 1.2 km west of the confluence point and started skiing, first over the farmer's field, then 500 m through an old and beautiful winter forest. Then 500 m over a large bog, then a small section of old forest, the over a 3 - 4 years old pine plantation. The confluence point is just north of this young plantation, in a 10 - 15 years old pine forest (plantation), and 300 m north of the bog's northern edge. Temperature was -18C (actually -20C, since the thermometer had slid a little along the scale, which I noticed when I was home again). The picture towards the south is taken almost exactly when the sun is at its highest (astronomical noon). The sun is shadowed by the tree trunk and branches, but within the frame. On the way home I stopped at the little open stream between lakes Stor-Kvammarn and Norsjön and tried to take a picture of the two dippers seeking food there. However, the digital camera is not designed for bird pictures, so the dippers sitting on the edge of the ice in -20C are quite small and blurry. 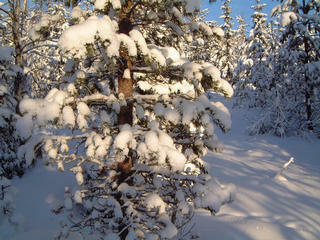 Home again at 2:00 p.m.
#5: GPS at 65N 19E , thermometer at -18C (0 F).